05-10-2017 What is that blob? Every year the camera lens takes a beating when the chicks are big enough to eat and ...well, eliminate what they have eaten. This year, we have a chick that has exceeded all previous direct hits to the camera lens. Yuck! It is disappoining to have the view of the chicks and all the activity in the nest box obscured by bird droppings. We will be able to clean the lens when the chicks are banded on May 18. Until then we will just have to look around the blob and use our imagination about the action. 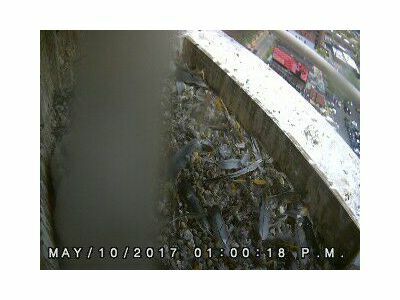 Many apologies for the current appearance of the nest cam (and the fact that the parapet cam will be out of service until the chicks have left the nest). Sometimes that is the frustrating part of watching nature and dealing with technology - neither one always cooperates with our wishes!